An EPDM roof provides long-term stability and protection for your business. Third Coast Roofing has the expertise and personnel to offer unparalleled EPDM roofing in Houston, TX. Commercial roofing represents an investment in your company. To get the most return for this investment, you need a roof that will give lasting value over the course of decades. 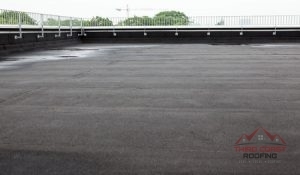 EPDM roofing has an impeccable track record of success. Unlike other types of roofing, EPDM has been around long enough to firmly establish its longevity. Third Coast Roofing can install EPDM roofing to the height of perfection. A thorough installation from an experienced professional like us renders a roof that can withstand the stress of the seasons and elements. To learn more about the value of EPDM roofing in Houston, TX or surrounding areas, give us a call today at 832.792.4975. Our team can install an EPDM roof on virtually any commercial structure. Commercial roofs should bring significant, measurable benefits to a business. The benefits you derive will depend much on the quality of installation. For EPDM roofing, installation becomes especially important thanks to the nature of the material and its reliance on adhesives. Third Coast Roofing supplies the premier service you need when you choose this remarkable, “rubber” roofing. Easy Repairs: A major benefit of EPDM roofing comes from the ease of repairs. Should something damage an area of your roof, our team can simply replace the worn-out section with new material. This complements EPDM’s relative lack of maintenance requirements. Thanks to high wind resistance and the tough rubber membrane’s overall resilience, you don’t have to worry about frequent upkeep. Proven Longevity: With an established lifespan of 40 years or more, an EPDM roof will protect your business across the long-term. Resistant to storm damage, punctures, and tears, EPDM also resists the simple wear and tear that afflicts other types of roofing. If you want a roof that takes the worry out of at least one aspect of your business, choose EPDM roofing. Peace of mind stands as perhaps the premier benefit of an EPDM roof. Once installed, it will quietly do its job across the span of decades. At Third Coast roofing, we’re proud to offer business owners the value of EPDM roofing around Houston, TX. For more questions, or to schedule a consultation or estimate, call us today at 832.792.4975. Updated on August 21, 2018 at 7:42 pm by Third Coast Roofing.